Mounting plate set for cover frame for System 55 and Gira E22. 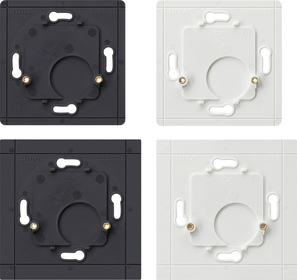 The mounting plates serve as adapter plates for attaching the wireless wall transmitters to smooth or transparent surfaces, e.g. glass panes. The mounting plate allows for a clean-looking closure on the back of the surface. Can be broken off, and thus also suitable for multiple combinations or for mounting on device boxes.